Marble flooring not only beautifies the interior of the home, it also increases the value of the property. Marble is long-lasting and requires little maintenance. This material is also more affordable than ever before. Marble is quarried in various parts of the world. It is formed over a period of millions of years, the result of tremendous pressure from the earth’s tectonic plates. High pressure and high heat combine to form a dense stone, and contaminants present in the rock during formation become lovely striations and vein patterns. Marble tiles are cut from huge slabs of stone. The process requires the use of specialty cutting saws, polishing equipment, and state-of-the-art measuring devices. Marble tiles are heavy, meaning that shipping the product from manufacturer to consumer is somewhat expensive. Stonexchange is a Florida-based manufacturer and importer/distributor of top-quality marble tile. We own the fabrication centers where our products are created, and we import large quantities of material on a continuous basis. Our customers enjoy true wholesale prices on large orders of marble tile because our entire import operation is based on bulk-quantity shipments. Marble is not only a popular choice for surfacing the floor of a new home, it is also the preferred material for interior redecoration and home remodeling projects. Before deciding what style and color shade to use, it is vitally important for homeowners and property developers to think about how a particular color will blend with other interior accents. When the correct shade is used for flooring, walls, and countertops, the room can be redecorated in several different ways without creating a negative color combination. White and off-white shades of marble blend well with darker tones. White marble is available in several different styles, some of which have little or no veining or splotching. These shades are often used in kitchens, bathrooms, and entrance foyers. Kitchens with dark-toned cabinets and appliances will look especially beautiful when the floor and counters are surfaced with white marble. The dining area will take on a stately appearance when white marble is used for the floor. Dark-stained wood or contemporary metal dining furniture stands out very nicely against brighter shades of marble. Cream or beige marble tones complement other neutral shades. These medium colors are often used in the bedroom as well as the kitchen. Cream/beige marble tiles offer the greatest flexibility when it comes to interior decoration. The walls can be almost any color, and upholstered furniture with dominant shades of grey, yellow, light brown, or tan will complement the beige flooring tiles perfectly. Beige marble is also a good choice for the kitchen floor if the appliances and countertops are similarly toned. Lighter shades of wood cabinetry and mosaic patterned backsplashes blend nicely with cream-colored marble flooring tiles. Beige marble generally has a good amount of streaking or vein patterns, meaning that installers have numerous placement patterns from which to choose. 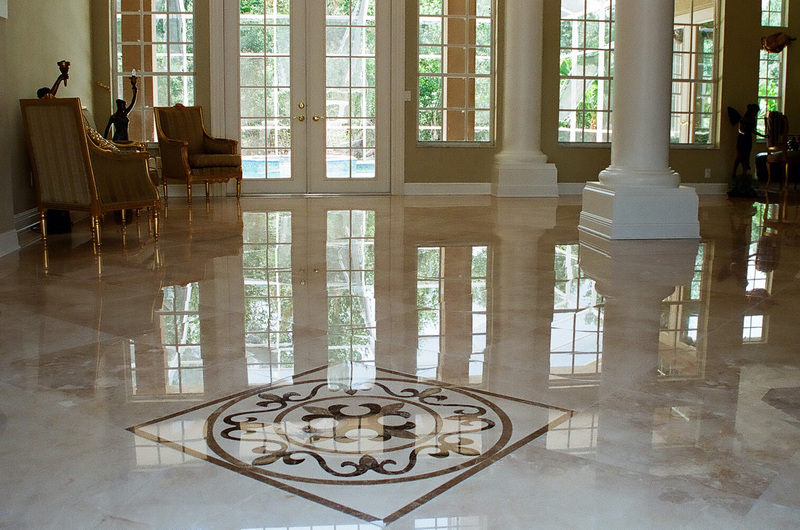 A carefully placed set of beige marble tiles results in a truly unique, one-of-a-kind floor surface. Red and brown marble tiles are often used in the living room. These shades are rather dark but have a warm appearance. Red or brown marble usually has brown or black streak patterns intermixed with tan, yellow, or off-white striations. Dark shades of marble look their best when complemented by several different colors used for the room furnishings. The Nalboor Tiles website includes a product showcase page that allows prospective customers to see exactly what the various marble floor tile colors will look like. The styles imported by Stonexchange reflect the demand for certain color shades in the flooring industry. Most of the tile colors available from Stonexchange are manufactured in several different sizes, each of which can be shipped directly from our company’s distribution center in Miami, FL. Bianco Dolomiti is a beautifully crafted marble tile that contains light streaks of gray and black. It is a perfect replacement for Bianco Venatino and is more affordable than most of the white marble tiles made from slabs extracted from quarries in Italy. This product is very bright in appearance, and the virtually straight vein patterns allows for numerous placement patterns. Bianco Dolomiti tiles are available in either square or rectangular cuts. Sizes range from 12-24 inches. The tiles have been given a fine polish and have been square-edged for easy placement. Vanilla Oro is an off-white shade of natural marble stone. It has cream-colored vein patterns that blend nicely with the dominant ivory tone. Popular for contemporary bed, bath, and kitchen designs, Vanilla Oro has medium-to-high reflective qualities and stands out well when bathed with a sufficient amount of interior lighting. Vanilla Oro is available from Stonexchange in 18-inch and 24-inch square tiles. The latter is 5/8-inch in thickness and is perfect for large dining areas or master bedrooms. Vanilla Oro tile is also a perfect wall surface material for the bath, especially when jewel tones are dominant. Nuevo Crema Marfil is a light-shaded beige marble tile. The stone is marked with yellow, red, or brown veins and splotches. Nuevo Crema Marfil has a very consistent tone, meaning that the entire floor surface will appear as a single piece of marble. Nuevo Crema Marfil is available in 12-inch, 18-inch, and 24-inch squares. The tiles have been given a complete polish and the edges have been machine-straightened. This is one of the most popular marble tiles offered on the Nalboor Tiles website. Other medium shades of marble available from Stonexchange include Crema River and Crema Bella. Both of these products have a dominant cream shade with beige, brown, or milk accents. Crema River is the perfect replacement for most of the marfil shades, and Crema Bella works quite well for designs specifying Crema Milk or Turkish Botticcino. Rojo Alicante is a dark shade of marble tile dominated by a consistent red/rust tone. The vein patterns vary in color and can be white, cream, or brown. This product is quite popular for use in the living room as well as for kitchen backsplashes. Adalia Cappuccino is a medium-dark brown marble tile. It has a warm appeal when used to cover floors in classically designed rooms. This tile is available in either 18-inch or 24-inch squares. Although Stonexchange lists standard tile sizes for all of the marble products listed above, custom orders for non-standard tiles are always welcome. Our company does not keep an supply of custom-size rectangular tiles in inventory, but we can have them manufactured at our overseas fabrication centers and deliver them to the customer in just a few weeks. Stonexchange does not charge extra for orders shipped directly from the manufacturing center. Nor do we charge a fee for custom-size tile orders. Our customers enjoy the same low wholesale pricing regardless of the tile size or cut configuration. At Stonexchange, low prices are the result of bulk shipments from our manufacturing center. Most of our natural stone products are available only in bulk quantities and are therefore purchased mainly by construction companies, independent installers, and flooring product retailers. However, our luxury marble tiles are available in smaller quantities and are therefore offered to individual consumers as well as to commercial clients. The larger the order, the lower the per-piece cost. The prices given on the Nalboor Tiles product pages are for full-crate orders, generally 3000-4000 square feet of material. Smaller orders placed by DIY homeowners will cost slightly more per square foot. However, the quotes we give our customers are usually far below current retail prices. Smaller orders can be shipped directly from our distribution center to the customer location. Most orders can be packed, inspected, and shipped out in less than two business days. We use overland freight companies to deliver our products throughout the continental United States. Stonexchange maintains an in-house quality control program that includes stringent standards for the packing of our marble floor tiles. We use extra-strong shipping crates and cushion our tile products against jarring and shifting. Industry standard damage is 10 percent, but at Stonexchange we strive to keep this figure much lower. Our tile products are available year-round. Our fabrication centers do not close up or ramp down operations during the winter. Customers looking for top-quality marble at wholesale prices often have trouble locating a suitable supply between November and April. This is because many quarries are owned by companies that sell their bulk material to brokers or middle-level resellers. Competition is fierce during the heavy construction season, and the supply of material is depleted by late autumn. Stonexchange virtually guarantees product availability throughout the calendar year. If you need smaller amounts of certain marble shades, do not hesitate to check out the great prices offered by Nalboor Tiles and Stonexchange. Our per-piece cost for quantities less than 3000 square feet is lower than what most retail operations can offer. Remember, the greater the quantity purchased, the lower the overall cost. However, we will save our customers money on any size purchase because we are the owners of our material from the time it is extracted from quarries until it leaves our distribution center. Contact us with your questions about order sizes, per-piece cost, and shipping details. Remember the name Stonexchange when you need the finest marble tiles at the lowest possible price. You will be dealing with a direct importer and distributor whose goal is to combine superior quality material with dependable service.